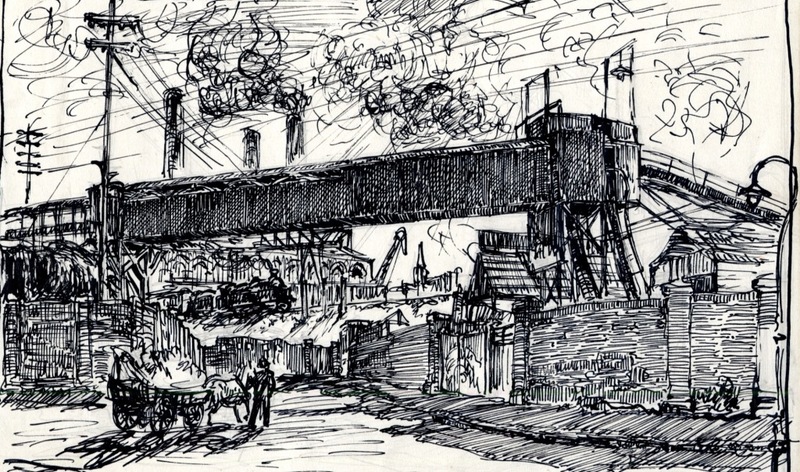 It was back in 2012 that I used a picture of Lots Road Power Station by Alfred Francis Griffen in a post and promised you would see more of the artist in the future. I’m finally making good on that promise. While I was scanning these images I googled Griffen to see if there was anything else about him out there, and all I found was my own post. So let’s see if we can shed some more light on an apparently almost forgotten artist. 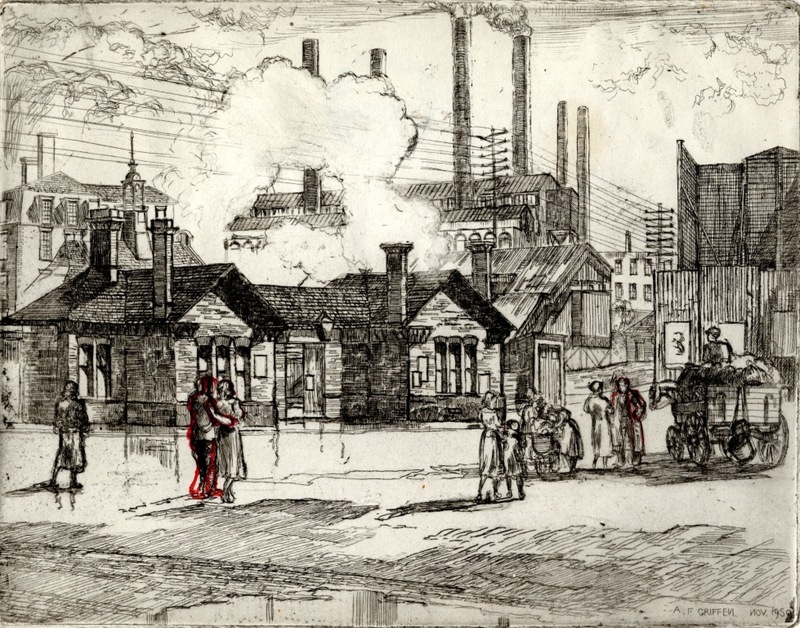 The Library has a small collection of work by Griffen, mostly sketches in pencil, ink and water colours with a few etchings and some finished works. These were donated to the Library by his widow in 1955. 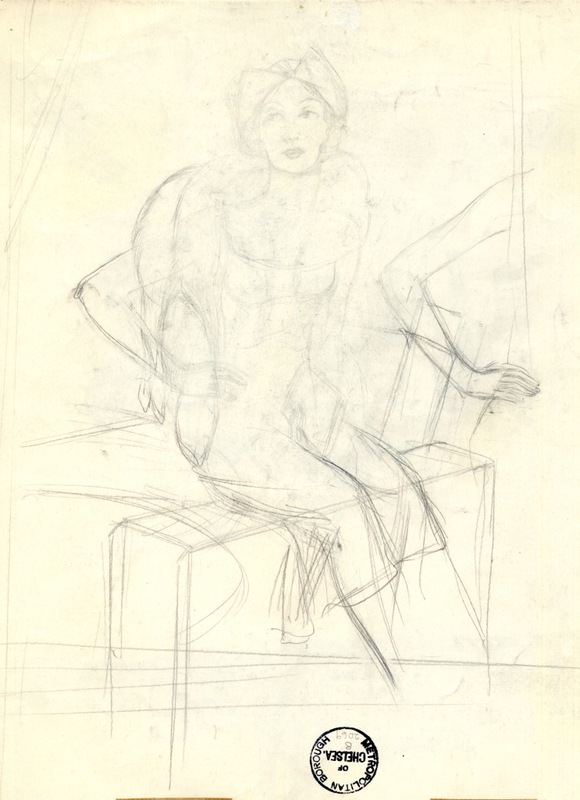 She must have known that even his sketches and unfinished work would be of interest in the future. 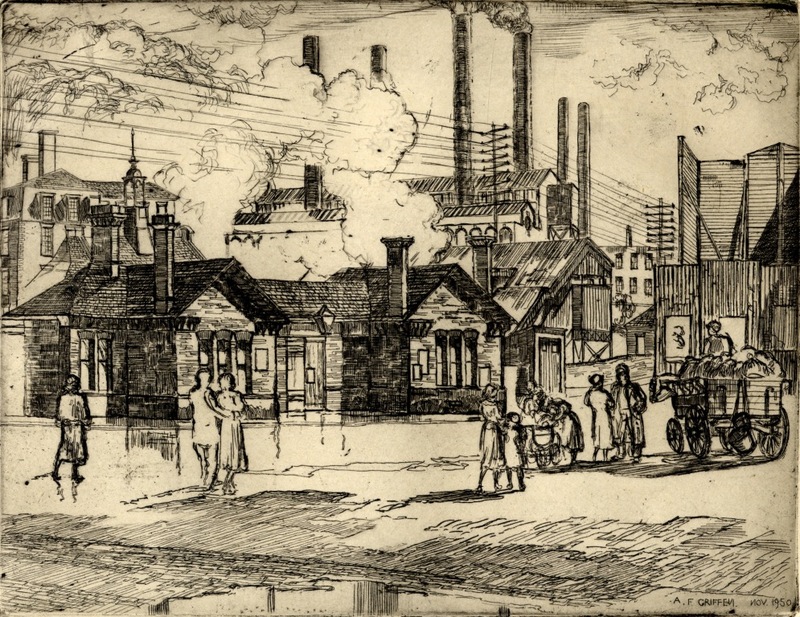 There is enough of this material to show that he was a skilled artist with an lively eye for detail and atmosphere. 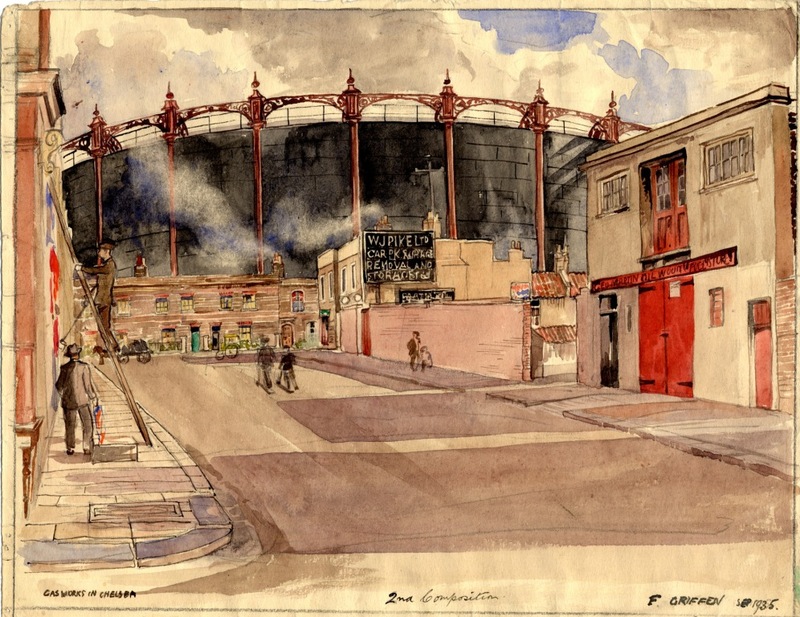 “Chelsea Railway Station November 1950” – This may be the station near the Chelsea Football ground which was closed in 1940. Some of the station buildings may have survived as long as 1950. He has marked the areas where he has made changes. Some more shading of the figures of the entwined couple has brought them to life. Underneath he has written “with suggested improvements in figures” in the same red ink. Half-finished sketches give some idea of how he created pictures. 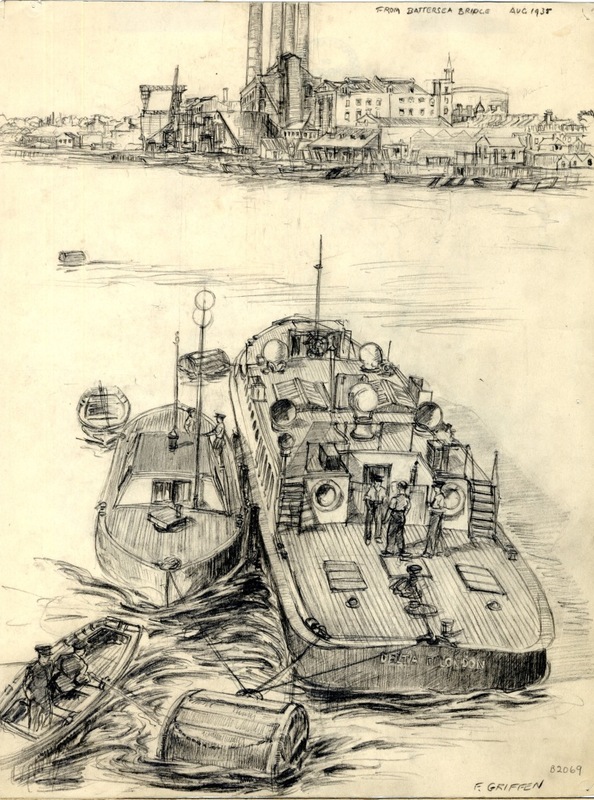 Finshed pictures show that all the careful sketching paid off whether the result was monochrome as in this drawing. 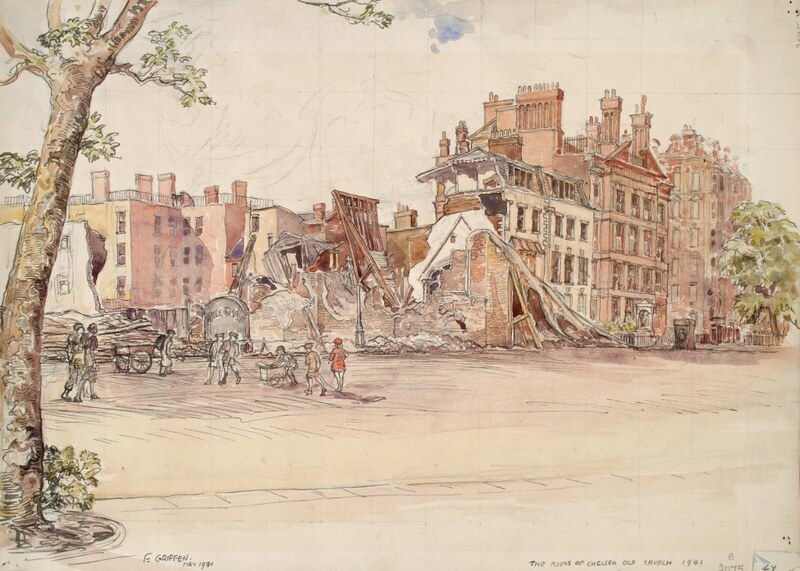 Or fully coloured as in this view of Chelsea Old Church after it was bombed in 1941. But I think his most personal material is about labour and industry. A dredger at work on the Thames. 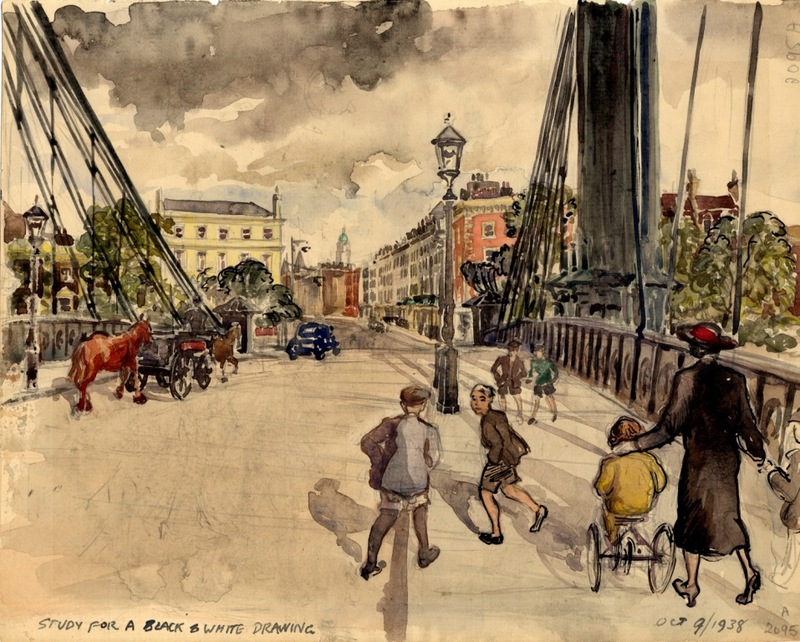 She looks smartly dressed as if she was going to appear in one of his views of Sloane Square, or Albert Bridge like this colour sketch for a drawing eventually completed in pencil. 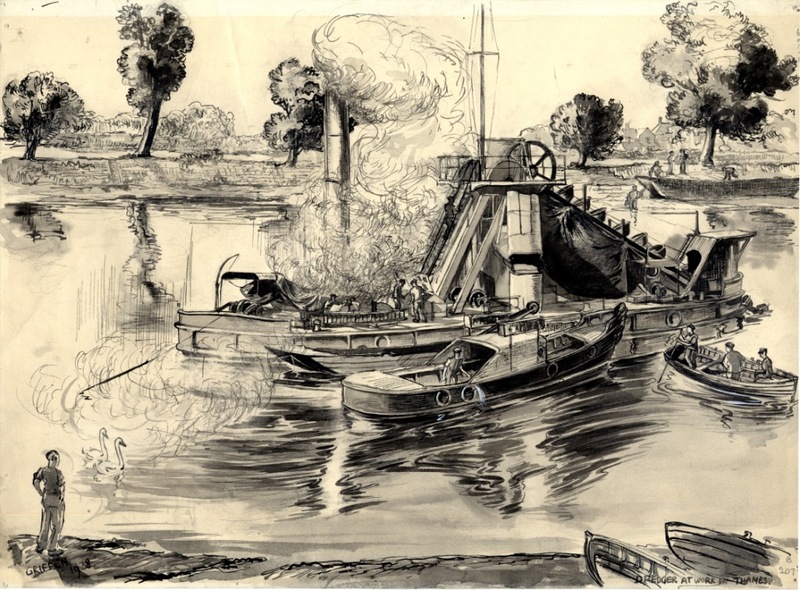 Or this picture, probably the best of his work in our collection. 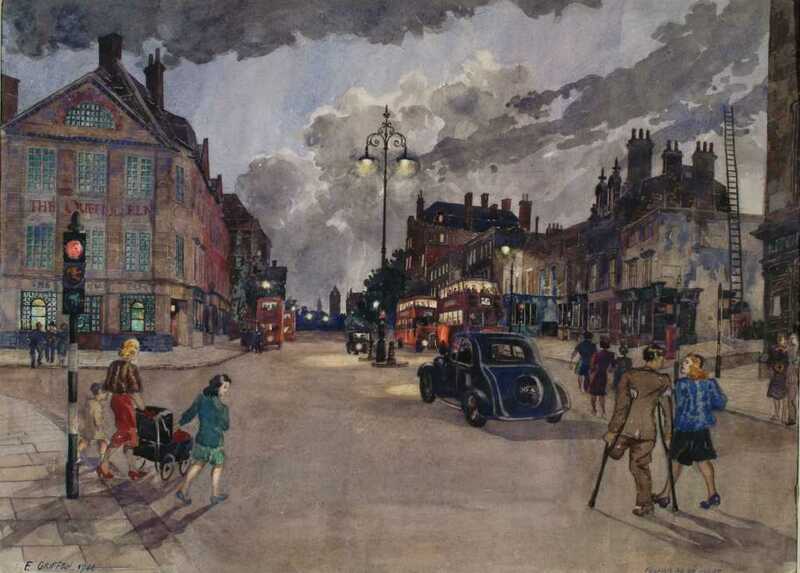 Fulham Road, at the Queen’s Elm, 1946. The war is over, the lights are back on. A disabled man and his wife cross the road. A woman in a fur jacket with three children crosses the other way The buses are running, fully illuminated. In the far distance the tower of St Stephen’s Hospital. I know this spot well from the brighter end of the century. Griffen has caught the smoky atmosphere of early evening in a city recovering from war. I think our friend Yoshio Markino would have recognized this scene. I haven’t completely exhausted our collection of Griffen pictures if you’re interested in seeing more. I don’t have a great deal of biographical information on him although I know some people have collected his work. He lived quietly in a flat in Gertrude Street, Chelsea with his wife Edith from 1935 until his death in 1955. Their surname was mispelled as Griffin in the electoral register in the pre-war years. Some years ago a gentleman sent us some greetings cards with Griffen pictures of other parts of London, which I have kept hoping that someday I would be able to use them, as I may in a later post. 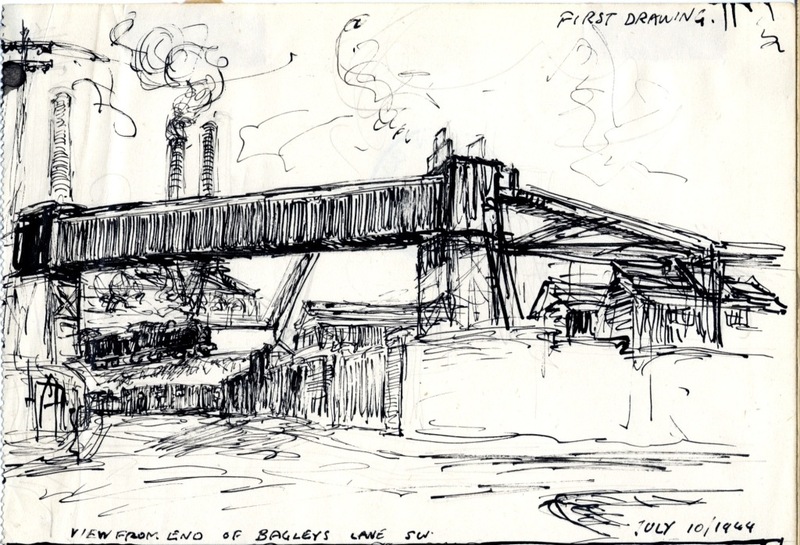 This entry was posted on Thursday, July 17th, 2014 at 12:14 am	and tagged with Albert Bridge, Chelsea Old Church, Francis Griffen, Lindsey House, Lots Road Power Station, River Thames and posted in 20th Century, Chelsea, Painting. You can follow any responses to this entry through the RSS 2.0 feed. Hi I got to know about the artist about three years ago and I tried to search about him as well. But didn’t have much success. His work is amazing I only have four big notecards. But two of them are the same. The cards all say a little information about him at the back and explains about the painting that is featuring in the front. These cards were printed in 1998. We have a set of those cards here sent to us by the gentleman who published them, who I believe owned a collection of paintings by Griffen. This was the only indication I had that Griffen was known to a wider public. At some point I’ll do another post on Griffen but in the meantime there were three other cards in the set – I’ll email you a copy of my favourite one. Hi, I’ve just worked it out. At first I was thinking, “That can’t be Milman’s Street” because at one end you have the S-bend on the King’s Road and the (ex-) Man in the Moon, while at the other end is the embankment. Then I realised that what we can see at the far end of the street must be the industrial buildings on the south bank in Battersea. Now in all makes sense. Apart from the date, which looks to all intents and purposes like March 28/1959, which is impossible, since Griffen died in 1954. It must be 1953 with the top half of the 3 almost closed. According to the electoral registers the Griffens lived at 9 Hobury Street from 1931 till 1934 and at 40 Gertrude Street from 1935 onwards. Both addresses are very close to each other in what has come to be known as the Ten Acres, now exclusive, but quite modest when the Griffens were living there. After Francis’ death in 1954, Edith Griffen continued living in the flat in Gertrude Street until 1961, by which time she has moved, again just round the corner, to 4 Shalcomb Street. Edith died in 1972 at age of 81. Alfred Francis Griffen was born in Winchester in late 1893 to Alfred Griffen, a whitesmith, and Caroline. Alfred Francis Griffen married Edith Burt in Chelsea in the spring of 1928. 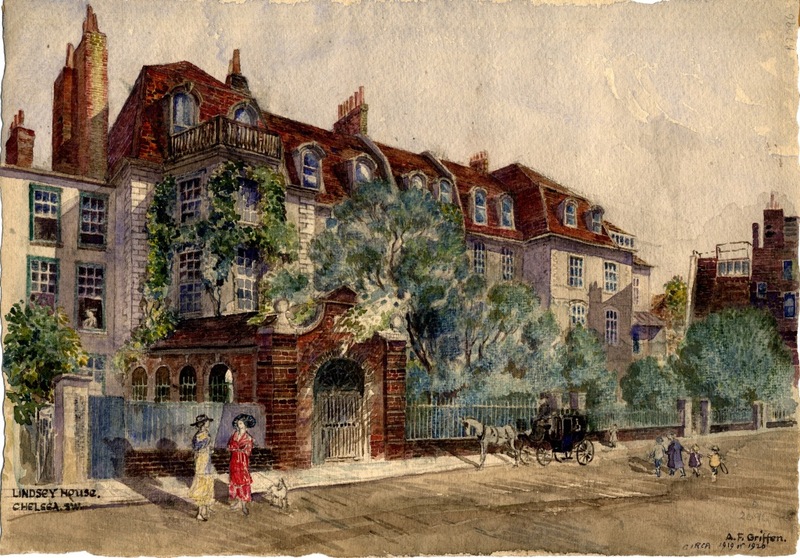 As an elderly woman, Francis’ widowed mother Caroline must have moved either during or after WW2 from Winchester to Chelsea to be near her son, as from 1946 (no electoral registers between 1939 and 1946) until 1949 when she died (14 December at St Stephen’s Hospital) she resided at 7 Shalcomb Street. “Probate to Alfred Francis Griffen typist (sic)” Presumably Francis also worked in the field of typography, as somehow I can’t imagine him in the typing pool. 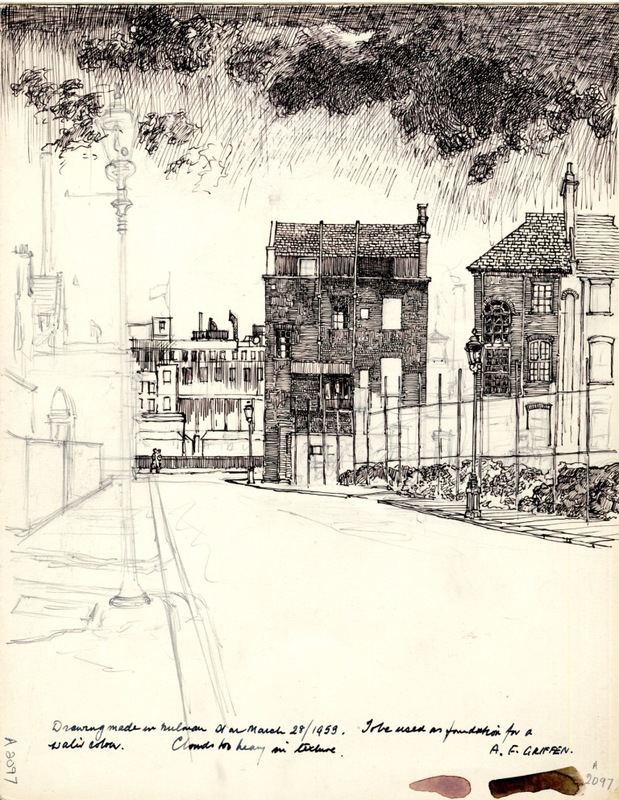 The sketch by A F Griffen of ” March Sunsine in Kings Road. 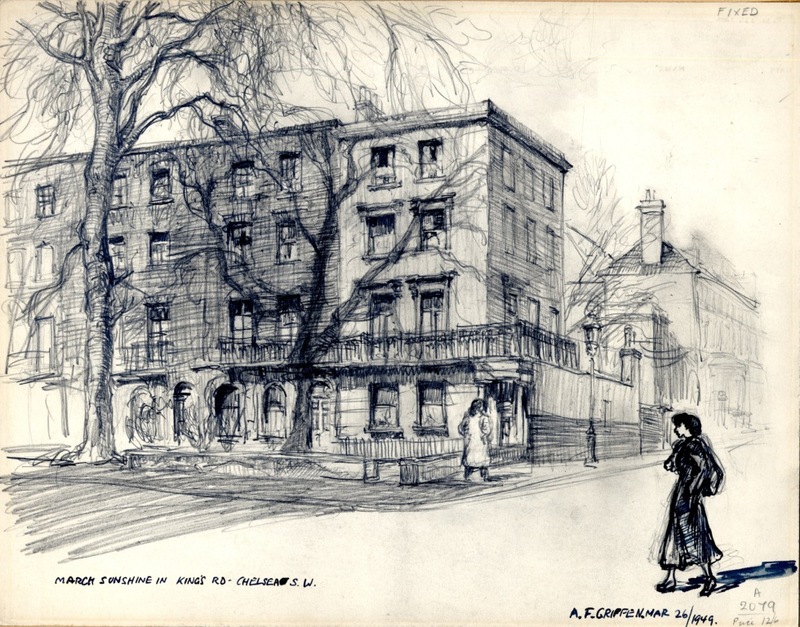 Would the location have been on the corner of Kings Road and Manresa Road, with the building on the right in the distance being the old Chelsea Library. I think you’re right.The low wall can be seen in an early 1960s photo by Bignell.